The question of what it is we cannot know is not only an important question in its own right, but has taken on additional importance in light of the recent rise of misinformation and alternative facts. 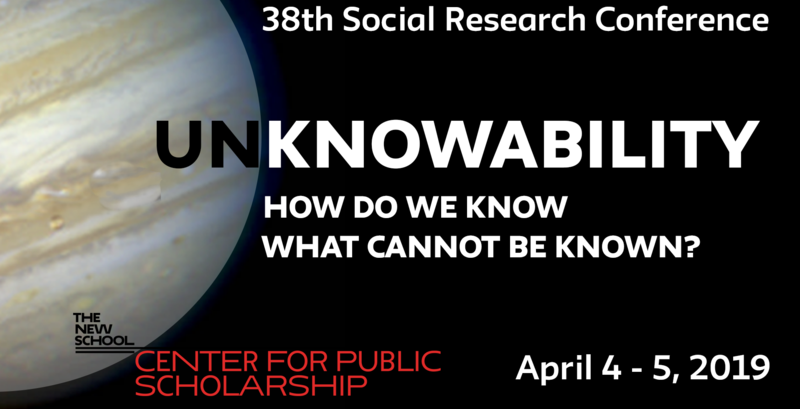 A better understanding of knowing whether something can possibly be known has the capacity to shape the direction of general knowledge, scholarly research, and public education. Furthermore, identifying what kinds of questions are unanswerable is of great intellectual and perhaps even political significance — to wit, Donald Rumsfeld’s now famous statement that “There are known knowns … there are known unknowns … and there are also unknown unknowns,” to which Fintan O’Toole added “unknown knowns.” This conference affords a rare opportunity for scholars from different fields to engage with each other and with the general public on this issue, particularly while we are living in what some might call a post-truth world. For more information regarding the 38th Social Research Conference Unknowability: How Do We Know What Cannot Be Known? (April 4-5, 2019) please click here.